Join us as we welcome back the titans of South African stand-up comedy as they will be raising the roof at the The Big 5 Comedy Show supported by Comedy Central. 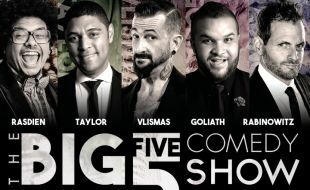 It’s an opportunity to spot the likes of John Vlismas and Joey Rasdien; face off with Stuart Taylor or hear Nik Rabinowitz and Jason Goliath roar in two wild shows which take place at the Teatro. The show also features the legendary DJ Ready D who creates an electric atmosphere with his scratching and mixing skills.